Community crisis centers answer Lifeline calls. The Lifeline is FREE, confidential, and always available. Help a loved one, friend, or yourself. 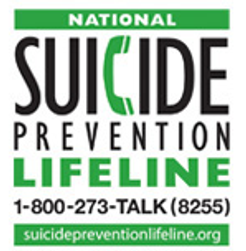 You don't have to be suicidal to use the Hotline; anyone in crisis is welcome to call. Talk about being a burden to others. Los of interest in things one cares about. Themes of death or depression in conversation, writing, reading or art.